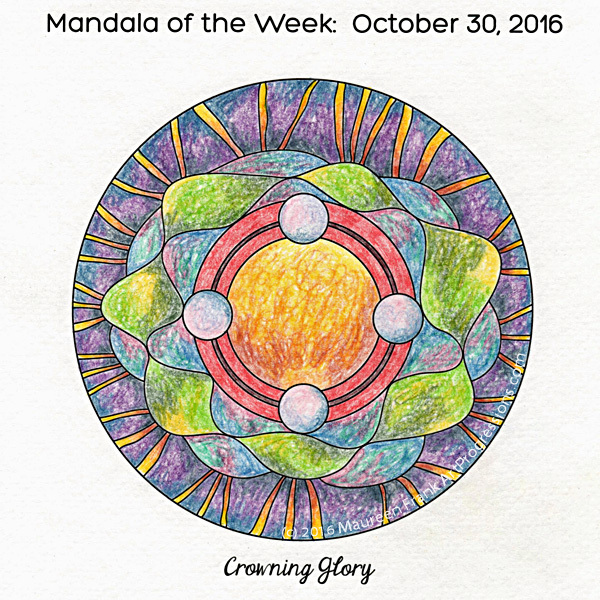 I present my coloring/painting of this week’s Mandala of the Week: Crowning Glory (from Sunday’s MotD post). For this version, I decided to color it all in dry with watercolor pencils, which in its own right came out pretty cool…at least to me (see next image). Except for the red/maroon bands, I used a combination of three colors per section. I created a slideshow of my progress through this painting which you can view via my ArtProgressions.com blog site. I used Derwent Inktense watercolor pencils for this painting. It’s fun to play with water and rainbow colors.